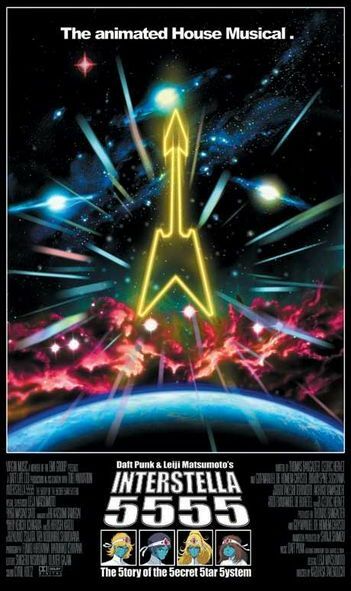 Interstella 5555 is a collaboration between French House band Daft Punk the and classic anime artist/director Leiji Matsumoto (Galaxy Express 999, Captain Harlock) resulting in a musical anime experience like no other. Told completely without any dialog, this animated Sci-Fi musical (done completely to the soundtrack of Daft Punk's "Discovery") tells the story of The Crescendolls, a famous intergalactic band from a far away galaxy. During a concert, the band is abducted by a mysterious army and brought to Earth. Under the control of the evil Earl of Darkwood, the Crescendolls are given human appearances and have all of their memories erased, beginning new lives on Earth as an up and coming new band. They quickly become a worldwide phenomenon. However, all of this doesn't sit too well with a security guard named Shep, who travels to Earth in order to free the band from Earl's control.